for $599,900 with 4 bedrooms and 3 full baths, 1 half bath. This 3,700 square foot home was built in 1987 on a lot size of 3.0700 Acre(s). Custom one of a kind GORGEOUS home(1.5 Story) with view of lake sitting on 3 acre park-like setting!This home is LOADED with fabulous amenities!Hearth room chefs kitchen has Granite counter tops, 42" cabinets, breakfast bar, walk-in pantry, recessed lighting, stainless appliances including trash compactor. Main floor laundry/mud room. Wood burning tile surround fireplace!2 master suites!1st master on main level with octagon(2 story) sitting room with window surround. Master bath has double sinks, whirlpool tub and separate tile surround shower.Walk out to 3 seasons room from master. 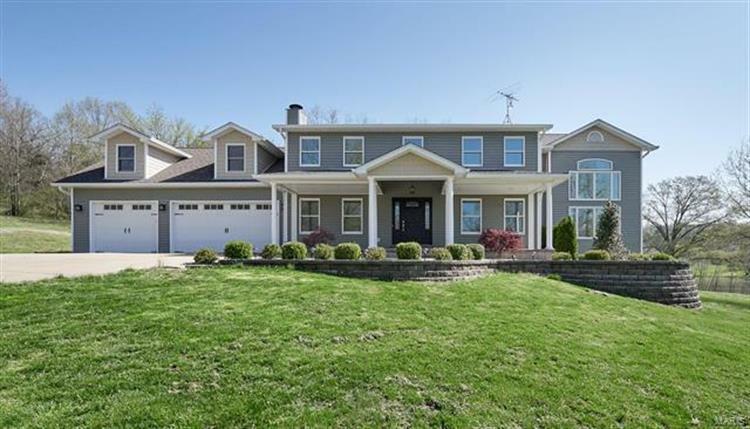 2nd master on upper level with spa bath, double sink, whirlpool tub.Huge loft area.Zoned HVAC, 2 hot water heaters, 5 car garage, library, recreation room, stamped concrete walk and large covered front porch, large deck, stunning lake views!Hardwood floors throughout. Lower level has egress windows and is walk-out. Professionally landscaped with outdoor lighting, all electric.Closets galore!THIS is a MUST SEE!